Sense of smell is an important sense to recognize environmental conditions and dangerous situations. Following the identification of the olfactory mechanism in the early 1990s, extensive studies to develop electronic devices that mimic the function of animal noses have been conducted. Most devices have been composed of an array of several sensors that react to chemical compounds. The odor is characterized by analyzing the response patterns generated by the sensor array. However, such devices have limitations in terms of sensitivity and selectivity. Hence, a novel concept for sensor devices functionalized with odor-recognizing biomolecules was suggested. Sensors which use biomolecules as a primary sensing material are commonly called bioelectronic noses. A bioelectronic nose generally consists of primary and secondary transducers. The primary transducer is a biological recognition element such as olfactory receptors and odorant-binding proteins. The secondary transducer is a highly sensitive optical or electrical sensor platform that converts biological events into measurable signals. 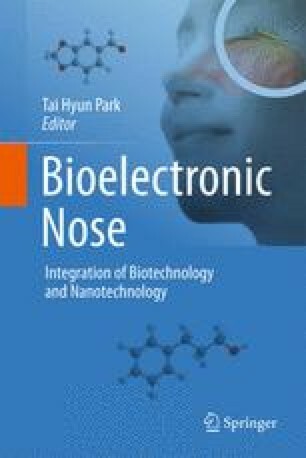 In this chapter, the basic concept and principles of bioelectronic noses are described. In addition, specific characteristics of bioelectronic noses and the current issues are presented. This work was supported by the National Research Foundation of Korea (NRF) grant funded by the Ministry of Science, ICT & Future Planning (No. 2013003890).